Hi there again, today I want to talk about new poncho I'm making. 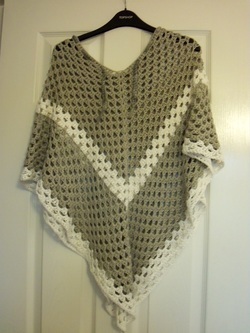 I've got quite carried away with poncho making this year, it was all inspired by pub lunch one sunny day, sitting in the beer garden of the Sun Inn, was a lady wearing a beautiful black granny-square poncho. and me being me, I made a few changes to it and finished it off over the weekend. It was made from beautifully soft bamboo and cotton. I loved it so much... I decided to make one for my little sister for her birthday. That one I made from a gorgeous sock weight yarn with different shades of blue running through it giving a stripy effect. I also decided that I'd do it in triple crochet rather than double... it was a great idea as the shape was more pleasing and practical, with the point at the front not being so low. 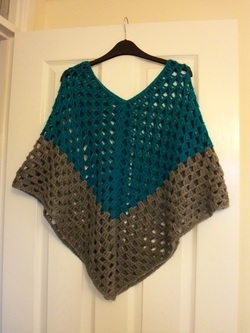 Poncho number 3 was the same as number 2, only made with turquoise and grey acrylic yarn. I have worn it so many times, it's great for walking to work on a cool morning. So, I've decided to make another, using the same yarn as number 2, only a completely different pattern. This time, it's going to be two rectangles sewn together to make the shape. It is going to be all sorts of shades of red and orange, in a ribbed effect... I will post photos once it's done!